"I am interested in learning from the wisdom and wealth of knowledge from colleagues, students, and the elders connected with Selkirk College." Leah is originally from Thunder Bay in Northern Ontario and has lived in Nelson for seven years. She has mixed ancestry and is Ojibway/Anishinaabe and Ukrainian. Leah is interested in supporting Indigenous students in accessing culturally safe education and feels that Selkirk College is a good fit to support this work. 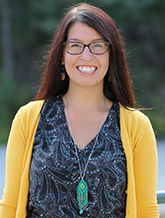 Leah has held various other positions in the community, including as the Program Coordinator at the Nelson & District Women's Centre, as a Vocational Counsellor, as a Clinician at Mental Health & Substance Use, and most recently, as the Kootenay Boundary Aboriginal Patient Navigator with Interior Health. Leah hopes to bring her perspective and knowledge about the importance of honouring Indigenous worldviews and ways of being as being central to Indigenous peoples holistic well-being, including Indigenous learners in a post secondary institute. Leah recognizes the impact of the socio-historical realities of Indigenous people in Canada, both past and on-going, and hopes to act as a bridge for Indigenous students and community members to feel connected and empowered. Leah's interests include being in nature and exploring our beautiful region, travelling as much as possible, practicing yoga, and reading.